Today, UH architecture professor, Dietmar Froehlich tells us about Margarete Schütte-Lihotzky and her kitchen. The University of Houston presents this series about the machines that make our civilization run, and the people whose ingenuity created them. N ext time you stand before your high-tech stove preparing dinner in your bright gleaming stainless steel kitchen, raise your cup to a pioneering Viennese architect. She was Margarete Schütte-Lihotzky, inventor of the modern kitchen. 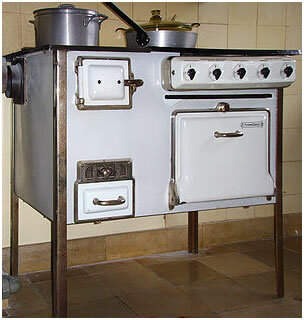 Early 20th century kitchens were unhygienic and impractical — a fire hazard, often put in a remote building. Or they were managable only by the wealthy with kitchen staffs. Schütte-Lihotzky saw a growing need among middle-class women and among workers pouring into city centers and crowding into small apartments. The Frankfurt Housing Authority planned thousands of low cost housing units in the mid-twenties. Schütte-Lihotzky was charged to find an affordable solution for a kitchen. Her innovative approach was based on two concepts: hygiene and ergonomics. She conducted time-motion studies of work done and paths traveled in a typical kitchen of that time. Frankfurter Küche, 1926, (Margarete Schütte-Lihotzky). She concluded a kitchen must have no wasted space. Manned by a single person, all functions should be accessible simultaneously. She envisioned the homemaker as the kitchen engineer. The functional improvements included electric stoves, often combined with a coal stove, hanging cupboards, and a work surface under the window. Here one could operate the kitchen from a swivel stool. 3 electric plates and one oven, coal drawer with warming drawer and plate above. The kitchen was meant to be purely a work area; meals were to be taken in another room. The first modular kitchen did not include specific appliances. It was designed as a functional workspace. It could be outfitted with appliances as the budget permitted. 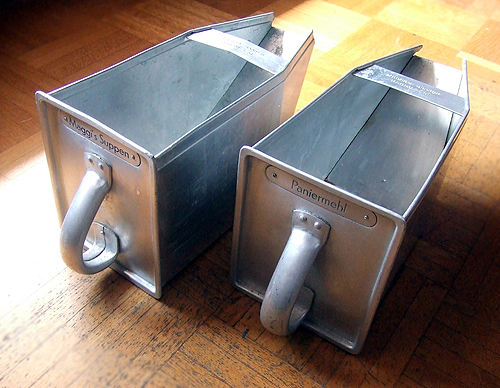 Staples were stored in modular glass bins, drawers were made of aluminum. The faucet could be utilized with one hand. Products such as the dish drainer and cutting board fit right over the sink. In fact, the whole kitchen was designed to be produced in a factory thus reducing cost. The cost of this first modular kitchen was added to the apartment’s rent. This additional monthly cost of one Reichsmark was so low a worker could earn it in an hour. 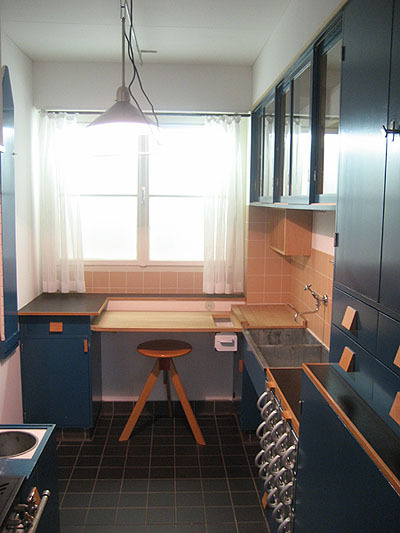 The new Frankfurt kitchen was devoid of excess decorations and ornament, purely functional and practical. The attractive blue-green paint used for the wood parts was suggested by scien-tists — it should repel flies from the windows nearby. To fully appreciate the new kitchen meant changing one’s lifestyle completely — and that was not easy. In the end, decorations, clocks, knick-knacks gradually found their way back into the clean utility of the kitchen. Maybe it really should be named the Vienna kitchen. 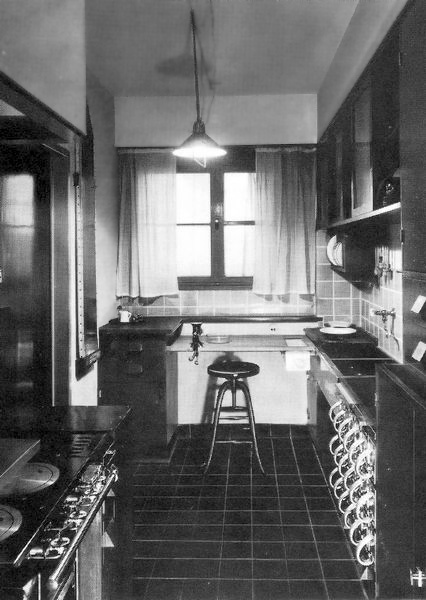 But the Frankfurt Kitchen, or Frankfurter Küche, got its name from having been installed in over two thirds of the 15,000 apart-ments built in Frankfurt at that time. Modularity and standardization meant that whole kitchens could now flow from factories. And they had the advantage of being designed by a woman for other women. I’m Dietmar Froehlich, at the University of Houston, where we’re interested in the way inventive minds work. Peter Noever (Ed.). DIE FRANKFURTER KÜCHE von Margarete Schütte-Lichotzky. (Berlin: Wilhelm Ernst & Sohn,Verlag für Architektur und Technische Wissenschaften Gmbh., 199)2. M. Schütte-Lihotzky and K. Zogmayer, Margarete Schütte-Lihotzky. Warum ich Architektin wurde (Salzburg, St. Pölten: Residenz Verlag, 2004). C. S. Chiu, E. Borchardt (Transl.). Women in the Shadows: Mileva Eins-tein-Maric, Margarete Jeanne Trakl, Lise Meitner, Milena Jesenská, and Margarete Schütte-Lihotzky. (New York, Bern, Berlin, Bruxelles, Frankfurt am Main, Oxford, Wien: Peter Lang Publisher Group, 2008). D. Coleman (Ed.). Architecture and Feminism (Yale Publications on Ar-chitecture). (New York: Princeton Architectural Press, 1997). M. Kristan (Ed.). Austrian Architecture in Europe. (Vienna/New York: Springer, 2003). See also the Wikipedia article on Schütte-Lihotzky. http://en.wikipedia.org/wiki/Margarete_Sch%C3%BCtte-Lihotzky.